Thanks to Taylor Made T-Shirts we have the commemorative Last Great Road Trip t-shirts. This makes it official we are over the top… Custom car graphics, T-shirts, world wide press coverage and our own blog. Mike at Taylor Made was great. He had his guys over there at Taylor Made take a version of our banner and create a silk screen. 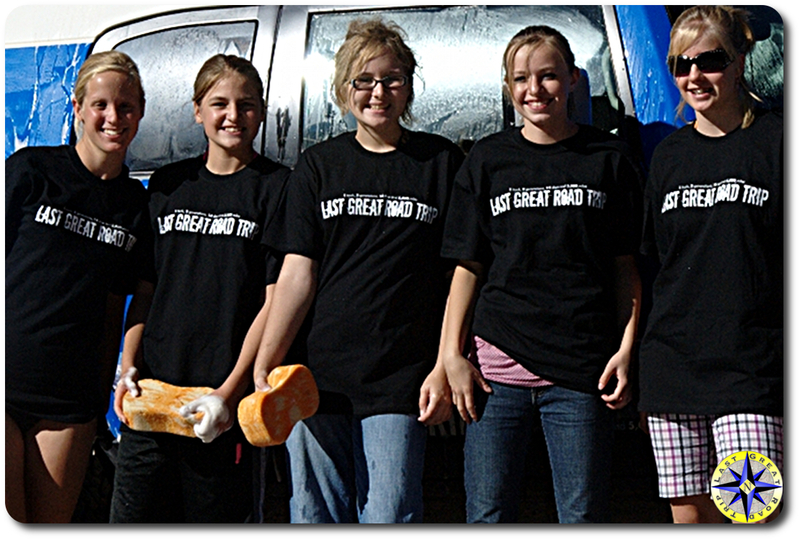 Than they ran a few shirts and look how cool the Hula Bettys are in her Last Great Road Trip T-shirt. The shirts are sure to become a collectors item… ok maybe not a collector’s item but tell us what you would do for one. We are planning to give the shirts out to folks we meet along the way. Well, I would continue to be the best favorite sister-in-law I could be (ie, don’t visit, don’t call, hold my tongue regarding mid-life crisis events…), AND I would also pay some money. I want one. Is it all about “wanting and not getting”, or will you post soon about how to order? Or will this be the year we exchange Christmas gifts? Hey, you know, my birthday is coming… Okay, I know, I know, I’ll just buy one.